Just one day after embattled executive Harvey Weinstein was essentially fired from The Weinstein Company, which he helped create with his brother Bob Weinstein, the company's board is seeking to distance themselves from him even further. A new report reveals the company's board of directors is considering a change of the company name, with the studio bringing on two different advertising agencies to develop a new "brand identity." This report also reveals that, as part of the fallout from numerous sexual harassment charges, Harvey Weinstein's name is being removed from all of the upcoming film and TV projects he was involved with before his firing. This report also reveals that, on early Sunday morning, after worrying that he might be given the axe by the company's board of directors, Harvey Weinstein reportedly sent out numerous emails to, "several powerful Hollywood associates," asking them to plead to his company's board of directors to give him a "second chance." It's unclear if anyone actually tried to save Harvey Weinstein's job, but later that day, he was fired nonetheless, predicting that his firing would, "destroy the company." Harvey Weinstein's brother Bob Weinstein, who has run The Weinstein Company's genre division Dimension Films for years, and Weinstein Company chief operating officer David Glaser, have been tasked with running the company in the interim, with this report claiming that the board of directors plan on meeting this coming Wednesday, to vote on whether or not Bob Weinstein and David Glaser should be running the company on a permanent basis. There has also been reports that Harvey Weinstein will sue the New York Times for the original report that brought these allegations to light for the first time. Both Bob Weinstein and David Glaser have been reportedly talking to numerous Hollywood power players over the past few days, trying to reassure them that The Weinstein Company is still in business. The scandal has even crossed over into the political spectrum, since Harvey Weinstein was a longtime Democrat supporter, with some critics calling out Barack Obama, Hillary Clinton and other Democratic politicians for not responding to these allegations in a timely manner. Representatives for Barack Obama and both Bill Clinton and Hillary Clinton would not respond to requests for comment about Harvey Weinstein's sexual assault allegations which go back several decades. Both Bob Weinstein and David Glaser held an employee town hall meeting on Monday morning to reassure Weinstein Company employees that they're still very much in business, even after Harvey Weinstein's firing. Producer Marvin Peart was in attendance, whose film The War With Grandpa is slated for release on February 23, 2018 by The Weinstein Company's Dimension Films label. 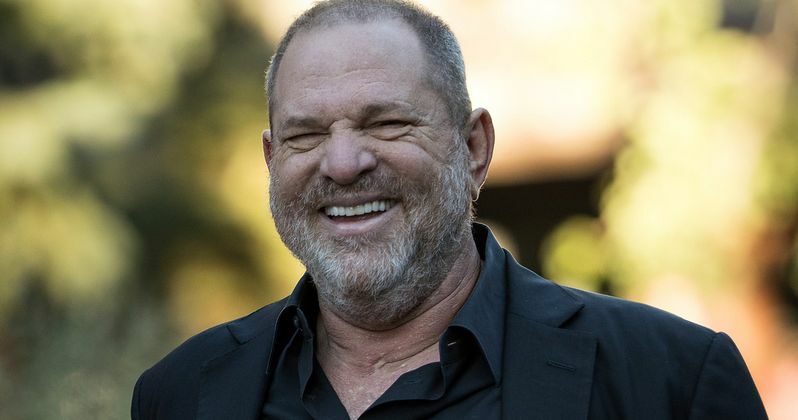 He confirmed that Harvey Weinstein's name was taken off the project, with Bob Weinstein telling the producer that it was a "complete separation" with the former executive. After the initial allegations came to light, another story surfaced that revealed Harvey Weinstein body-shamed actress Hayley Atwell in one of her earlier roles, the film Brideshead Revisited, where he called her a "fat pig." The allegations against Harvey Weinstein are just the latest in a string of misconduct that has come to light in recent months, with former Birth.Movies.Death editor Devin Faraci stepping down after he was accused of sexual assault, while allegations against Ain't It Cool News founder Harry Knowles lead to the Alamo Drafthouse cutting all ties with him. This new report from The Wall Street Journal also claims that both Harvey Weinstein and Bob Weinstein have had a contentious relationship for years, with one incident getting so heated that Harvey punched his brother in the face, knocking him to the ground. Bob is also said to have a "hot temper" himself, known to scream at his employees who worked for him.